The USA, Canada and Mexico were awarded the hosting rights to the 2026 World Cup. While the outcome was for a while in doubt, United 2026 won in a rout by a vote of 134-65 over Morocco. 1. What FIFA wants, FIFA (usually) gets. The first time the USA was awarded the hosting rights to the World Cup was in 1988 when it was awarded the 1994 World Cup. The USSF was insolvent in 1986 and in the process of moving its offices from an airport hotel near John F. Kennedy International Airport in New York to Colorado Springs, where the rent was free, when FIFA, smitten with the U.S. market after the success of soccer at the 1984 Olympics, started hinting that the United States would be a nice place to hold the World Cup. How badly did FIFA want the World Cup to go to the USA? Two Brazilians, including President Joao Havelange, were in the executive committee, but neither voted for Brazil, one of three bidders along with the USA and Morocco. In 2010, FIFA president Sepp Blatter voted for the USA in the 2022 World Cup bid race, but Qatar had other ideas and took advantage of the rampant corruption on the executive committee to win easily. That FIFA's bid inspectors labeled a World Cup in Qatar a high-risk didn't matter. Most members of the executive committee ignored the report. Within FIFA's administration, the USA still remained popular, and it was all but guaranteed the 2026 World Cup if it bid again. But any decision on the 2026 World Cup bidding process -- or just about any FIFA business for that matter -- was put on hold when the hints of corruption that had been swirling around FIFA for years blew up with the arrests of seven men on the eve of the 2015 FIFA Congress at which Blatter was to be re-elected. FIFA would get its way, but it would take a little longer. There was no reason to seek out the support of the U.S. government as long as FIFA's name was dirt in Washington. 2. Gulati waits to pounce. Haunted by the defeat to Qatar in 2010, U.S. Soccer president Sunil Gulati wasn't going to put the federation through the same thing again unless there were changes in the bidding rules. And if that meant waiting, so be it. The technical report that was ignored in 2010 had to mean something, and the extravagant spending that Qatar used to sway voters had to stop, especially if the voting pool was expanded from the 24 members of FIFA's executive committee to FIFA's 211 national associations. The other condition was that the results of the vote -- who voted for whom -- had to be rendered public. Gulati, a member of the FIFA council, the successor body to the executive committee, secured from FIFA a one-year window to fast-track the bid. FIFA didn't give the bid -- expanded to include Canada and Mexico -- an exclusive option on the 2026 World Cup, but the one-year window made it almost impossible for anyone else to organize a serious bid or conduct the kind of lobbying Qatar did for more than a year to sway the executive committee in 2010. Morocco was a surprise entrant on the final day to enter the race in August 2017 -- FIFA didn't want the World Cup to go unopposed to United 2026 -- but the Maroc 2026 bid committee didn't get into action in a serious way until late January. Instead of Gulati running the show, the task of heading the bid fell to Steve Reed and Decio de Maria, the head of the Canadian and Mexican federations, respectively, and Cordeiro, the retired Goldman Sachs executive who had cut his teeth in international soccer working on the failed 2022 World Cup bid. For the last two months, following the submission of the bid documents in March, the trio split up and formed three teams, touring the soccer world to meet any federation or confederation that would see them. "We traveled like an extended family," said Cordeiro. "We got chat groups and WhatsApp lines, so everyone knew what the other was up to, how meetings were going, what was the feedback. I cannot stress enough the degree of connectivity and how we were a family. And when people saw us, there was that sense of bonding and deep sense we really liked each other." It was three against one. Morocco, trying to play catch-up, could not be everywhere where United 2026 was and was forced to rely on surrogates, former African stars hired as ambassadors, to present its story. 4. DFB sways FIFA, then voters on task-force report. FIFA still had a dilemma. The five-person task force it sent to North America and Morocco wrote up a report heavily favoring United 2026 -- Maroc 2026's bid was labeled "high risk" in three fundamental areas, stadiums, accommodations and transportation -- but FIFA could not be seen putting its thumb on the scale and disqualify Maroc 2026 before a vote of the FIFA membership in Moscow. While Morocco gained the support of the French, Italian, Dutch and Belgian federations and the Spanish federation was neutral, the German federation played a key role in swaying support for United 2026. DFB president Reinhard Grindel, a member of the FIFA Council, was outspoken in warning FIFA to let the bid race go the distance but stressing that the membership should not vote for a "not-qualified bidder." When the task-force report came out on June 1 and raised serious issues about Morocco's capabilities, Grindel said it handed the momentum to the North American bid. And when the DFB came out in favor United 2026 on Tuesday, Blatter, now out of soccer but a supporter of Maroc 2026, said in an interview with L'Equipe after the results of the vote were made public that the DFB's support turned the winds in United 2026's favor. 5. Geopolitics add to margin of victory. Like others, though, Blatter was surprised at the margin of the United 2026 victory. The USA, Canada and Mexico finished with more than twice as many votes as Morocco. 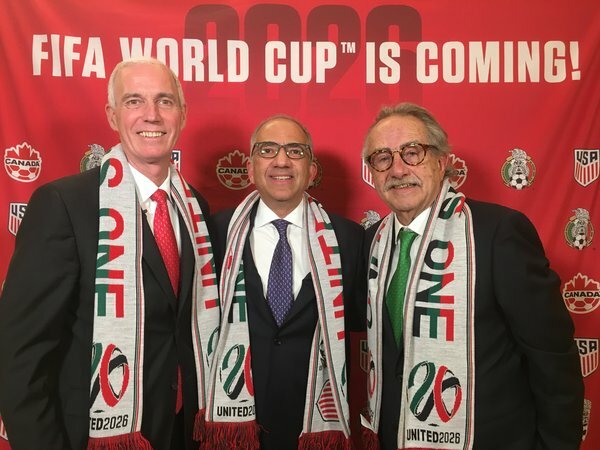 The fear that anti-Donald Trump sentiments around the world -- which had pushed Gulati to encourage a multi-nation North America bid -- would hurt the United 2026 bid proved unfounded. If anything, geopolitics worked against Morocco. Maroc 2026 ended up losing the support of 11 African nations, including Botswana, Namibia, South Africa and Zimbabwe, which all support of the "right of self-determination" for the Sahrawi Arab Democratic Republic, which Morocco claims as the Western Sahara. The influence of Turki bin Abdel Muhsin Al-Alshaikh, the chairman of Saudi Arabia's General Sports Authority, as a Middle East power broker grew as Saudi relations with the USA cultivated by Jared Kushner, Trump's son-in-law and the go-to person in the White House on World Cup bid matters, improved. Of the 14 members of the South West Asian Football Federation Turki recently formed, only one, Oman, didn't vote for United 2026, a huge blow for Morocco, which was counting on the support of Muslim nations in Asia. 1 comment about "How United 2026 won -- five reasons why World Cup is headed to North America". Bob Ashpole, June 13, 2018 at 8:47 p.m.